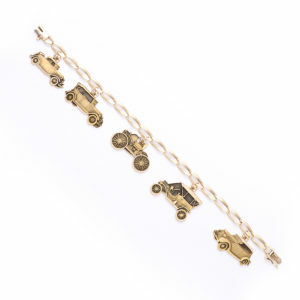 This bracelet features five gold and enamel charms depicting various Ford motorcars, the reverse engraved with each model’s name, dates, and production numbers. The link bracelet is by Tiffany & Co. and the charms are by O. C. Tanner, a Salt Lake City firm established in the 1920s. We have yet to encounter similar bracelets and welcome any commentary. Have you seen anything like it before?